The flooding in Haiti has consumed lots of effort and free time of many, both in Haiti and abroad. After the floods, I made several trips to Gonaives which was hit the hardest. The hurricanes carried in an extreme amount of mud. Whole houses were full of mud the whole way to the ceiling. 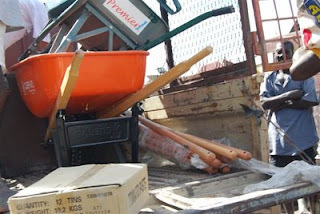 The last trip to Gonaives was to take in wheelbarrows and shovels. I found several willing church groups to help with the cleanup efforts, and we provided them with some tools to help get the job done. This included shovels and wheelbarrows, and some bulk food for the workers.